From the image below, A is an open bezier curve with it's points positioned to represent a circle. AP3 and AP1 have the same position. 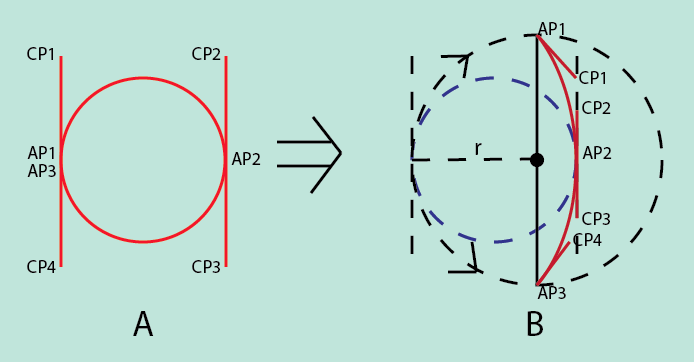 From B, How can I move the points (AP1 and AP3 along the bigger circle of radius r whiles the CP's reduce in length as CP1 and CP4 also rotate) till they form a symmetric bezier curve at the center of the bigger circle marked as the red curve? To keep things simple & consistent, let's stick with circular arcs throughout. We'll have our first circle with radius \$r_1\$, shown in red below. 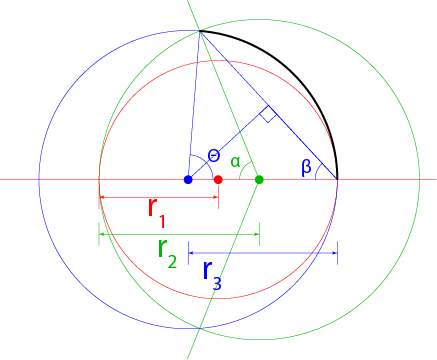 Then we'll use a second radius \$r_2\$ to define the new positions of our endpoints as the curve swings open by an angle \$\alpha\$, shown on the green circle below. Then we'll draw a third circle, through our moved anchor points \$AP_1\$, \$AP_3\$ and the one we left stationary \$AP_2\$, shown in blue below. This gives us a unique arc to follow. Now we have a center (\$\vec C_3\$), a radius (\$r_3\$), a start angle (0), and an end angle (\$\theta\$), so we can draw a cubic Bézier curve along this circular arc using the technique described in my earlier answer. For the lower half, just flip the y coordinates along the horizontal. // Buffer for our final spline's anchor & control points. // How much of the inner circle should we start with? // Size & center of our inner circle (red). // Size & center of our second circle (green). Vector2 _secondCenter;  // Computed from radius & coverage. // How far should we swing the anchor points out around the green circle? // Size & center of our third circle (blue). // to our inner anchor points before we've swung them outward. // Place the anchor points of the original circle. // Place the second center so the green circle passes through the endpoints. // Swing out our anchor points along the green circle. // Find the center of the blue circle joining these anchors. // If they're in a vertical line, abort and just draw a straight line. // Phew, we have a non-infinite circle! Place its center & radius. // Find the angle of the endpoints around this blue circle. // Handle reversing concavity correctly. // Populate our Bezier curve buffers using code from previous answer. // Convenience method for plotting a point in polar coordinates. Not the answer you're looking for? Browse other questions tagged unity mathematics curves or ask your own question. How can I maneuver an AI pirate ship for a sea battle? How do I get AI Agents to move along a curve?